Very excitingly, the Tim Tam Bus came to Sydney the other week, down at Circular Quay. This is all part of the marketing activity for the new ‘treat pack’ size that has been recently launched – you will recall we already looked at the Choc Orange variant. I wasn’t able to spend as much time on the Tim Tam Bus as I would have liked, but I did note that the Choc Orange was not the only new flavour launched with the new range. Oh no. There was another one – the Double Choc Vanilla. For some reason this version has not found its way to my local supermarket, but I was subsequently able to track down a pack so that I can now reveal to you, dear readers, its innermost secrets. But before I do that, I must get something off my chest. You see, I stumbled across the Tim Tam Bus quite by accident, but it turns out its arrival was not unnoted in the blogosphere. Indeed, apparently Arnott’s actually invited some bloggers to attend. Now, I’m a humble sort of a fellow, but, well, I do feel that having ploughed through every variety of Arnott’s sweet (and a number of savoury) biscuit lines, showing my loyalty and sharing the Arnott’s love all over the internets, well, perhaps it’s not too much to ask for such an invitation? Hey ho. I guess it’s all down to numbers – because, sad to say, dear reader, there’s a good chance you will be the only person to read my blog today. Indeed, it’s quite possible you’ll be the only person to read it this week. 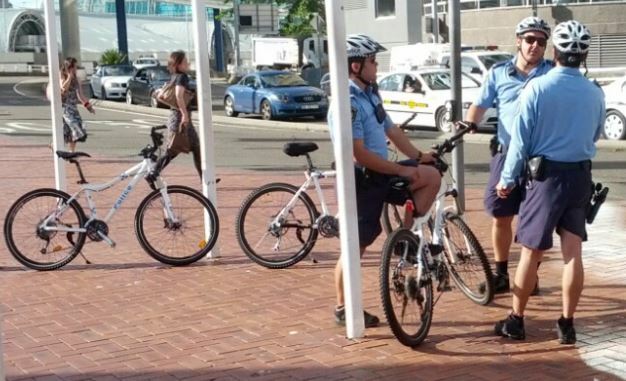 And perhaps Arnott’s have brand alignment problems if they associate with a bicycling weirdo who revels in breaking the law. Unrequited love is, as they say, the purest form. So never fear, Arnott’s, I will stand by you. But I just wanted to say that. If that’s OK. 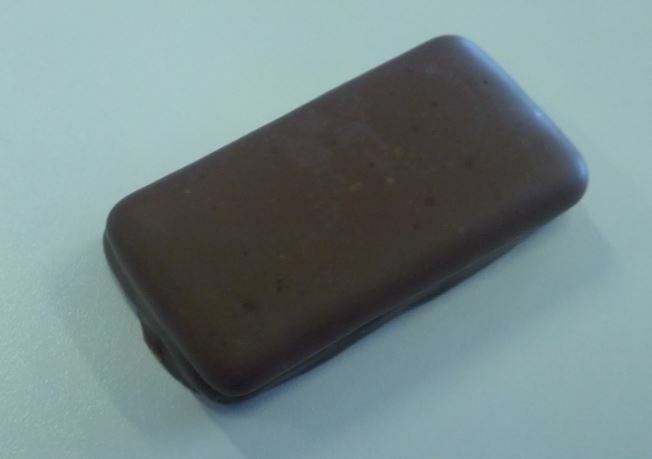 So, what does the Double Choc Vanilla Tim Tam taste like? The first thing to note is that the ‘double choc’ seems to be broadly synonymous with ‘double coat‘. They have a nice thick chocolate coating, but I have to say it seems slightly less thick than the true double coat. (I’ll have to do a side-by side comparison to verify this.) Either way, it is the standard milk chocolate, and the vanilla creme is white in appearance. And they actually taste pretty good. The vanilla is quite understated, and I reckon in a blind tasting a lot of people would mistake them for regular Tim Tams. Indeed, I had to surgically extract some of the creme from the centre of the biscuit to verify that it was indeed vanilla flavour. I don’t see this as a fault, though; it’s rather refreshing given that many of the flavoured Tim Tam varieties are so brash and full on. 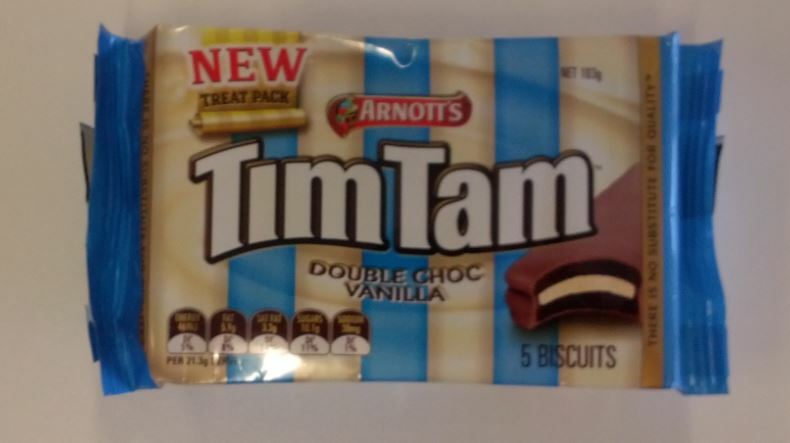 I liked these, and would rank them as at least as good as the Tim Tam Original. Perfect for a treat! As I detailed in another post, I recently fitted out the Radish with another child seat, to facilitate the carriage of both my kids. 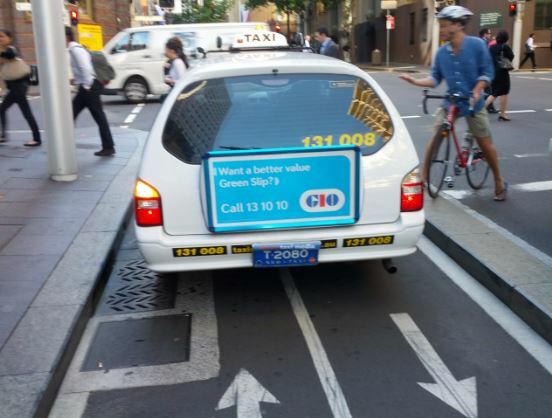 Whilst I’m very happy with the outcome from a kiddie transport perspective, it did raise another issue. The Yepp Maxi seat does not fit directly to the deck on the back of the bike, but to an adapter which it in turn bolted to the deck. 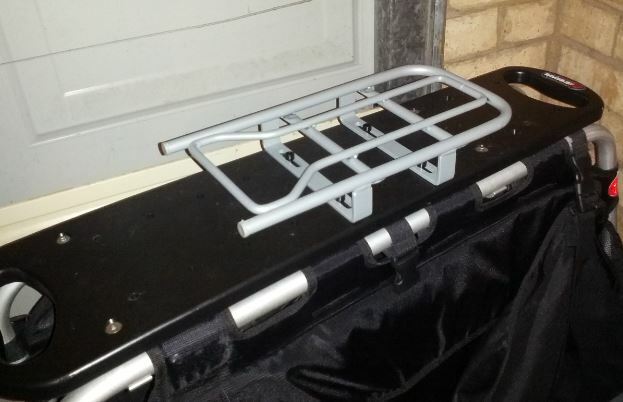 This adapter (in essence it’s the top bit of a regular bike carrier that accepts the Yepp seat) then sits proud of the deck by about three centimetres, but only extends a short way along it. This means the long expanse of deck I strap my trombone to is no longer available. The problem was a pressing one, as I needed to be able to get to rehearsal with the thing as Mrs Chillikebab needed the car. I had previously considered making some sort of box or short platform to bolt behind the adapter, to raise up the rest of the deck to the same level. However, as I thought about it more I happened to glance at the old wooden deck I had removed from the bike (in order to install the seat I had to switch it for a different design which has mounting holes and is a bit narrower). 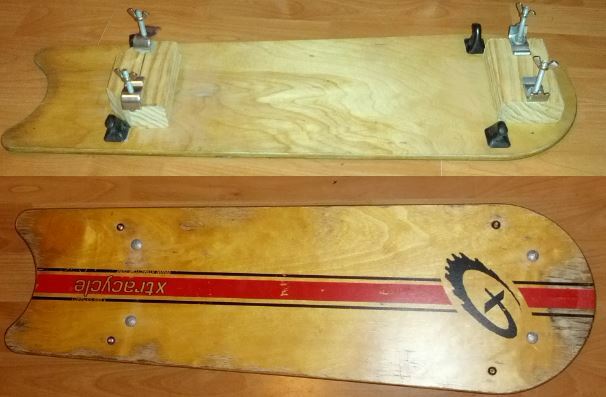 Suddenly the solution presented itself – simply bolt the old deck over the top of the adapter with some long bolts and wingnuts. A quick trip to Bunnings and I had the requisite parts. I drilled the holes into the wooden deck in the right places, and it was all very easy; secure the bolt to the deck at the bottom with a nut, and then simply drop it into place, securing underneath with the wing nuts. This took me all of ten minutes to do, but looking at it I was concerned that any lateral pressure on the rack would transfer to the point where the bolt was secured to the plywood deck, possibly cracking it. So I added a couple of wooden blocks underneath, glued to the underside of the deck, to give a longer ‘sleeve’ for the bolt to sit in. And that was it. Mrs Chillikebab was impressed; it was probably the first time I’d ever said a job would take ‘an hour or so’, and I’d actually finished it in under an hour. Usually ‘an hour or so’ means ‘all day’ (with ‘a couple of minutes’ meaning ‘a good hour’, and ‘it will take a whole day’ meaning ‘at least two weekends’). There’s a few little refinements I need to make; I need a few more washers to get the level exactly right, and I’ve had to improvise some spacers underneath at the back as the wingnuts don’t fit right under the deck as they catch on the tubes at the side. I need to find a more elegant solution to this, as it’s a bit of a fiddle getting the wingnuts on and off. Still, it works, and I was able to strap my trombone to it and get safely to rehearsal. 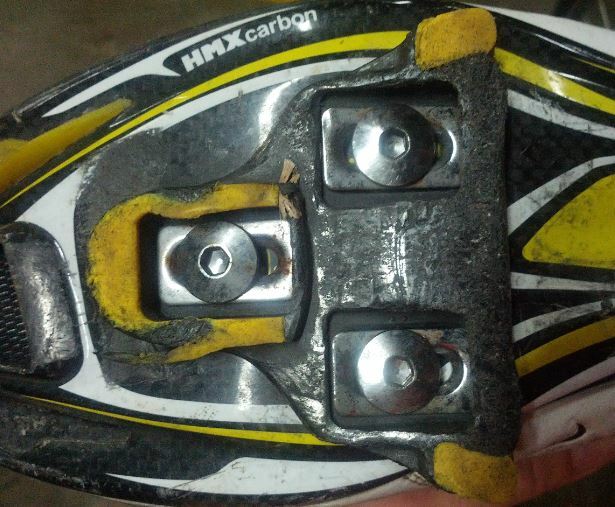 I can also put it on and take it off the bike in a matter of seconds, which is important – when little children want to be taken to the park, they don’t want to wait whilst I track down the right sized spanned to unbolt some bike accessory in order to fit their bike seat. I guess the only downside of this is that the trombone is both higher and further back than previously, and this does detrimentally affect the bike handling. Its a particular problem at low speeds – you have to work quite hard to balance the bike, which actually creates some strain on my back. In any proper city with decent cycling infrastructure it wouldn’t be a problem, but to get to rehearsal I have to navigate the joy that is Gladesville Bridge – navigating around all the obstacles and ramps was a little tricky. Still, it’s manageable, and I’m quite happy that I solved the trombone conundrum so quickly and elegantly. One of the things about having a Kindle is that you read some different books. Amazon really sucker you in with those ‘daily deal’ things. The other thing I have discovered (after my little rant a few weeks ago) is that Kindle e-books do have a cover – it’s just that when you select the book from the menu, it jumps to the first page. However, if you go back through the pages from that point, you do indeed get to the cover. I searched in vain for a way to make this the default behaviour, but to no avail. I bought this book because it was twenty cents or something on the ‘daily deal’, and was advertised as a ‘sensation’. It also promised to be a light read, and after some of the heavier books I’ve read of late, I thought it would be a welcome diversion. It is the story of Allan Karlsson – a centenarian explosives expert who escapes from his residential home, fleeing from his hundredth birthday party. There then follows an unlikely tale with a range of colourful characters, an international drug cartel, several inadvertent murders, an inept police investigation and an elephant. During these episodes we also learn about Allan’s previous life – he somewhat haplessly manages to be instrumental in shaping the whole of twentieth century history, dining with world leaders from Stalin to Truman and both starting and quelling various wars and revolutions along the way. 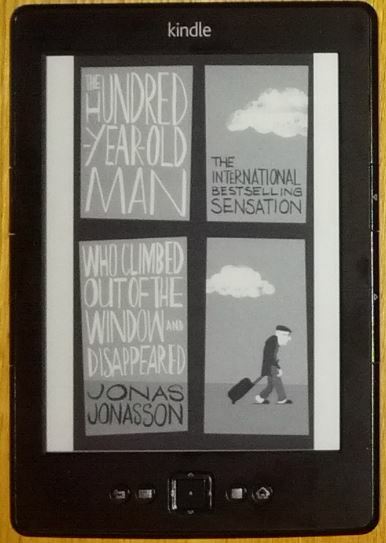 The whole thing is utterly preposterous, but somehow Jonasson keeps the momentum up page after page – it flies along at a cracking pace, and has more unlikely twists than a roller coaster. It requires very little in terms of intellectual energy, but it is entertaining and had me laughing out loud in places. What with toddler Chillikebab pretty much graduating into ‘Little Girl Chillikebab’, and Baby Chillikebab II graduating into ‘Toddler Chillikebab II’, I have been in urgent need of sorting out a transport solution for both of them. The little BoBike seat on the front is getting too small for Little Girl Chillikebab, and so the obvious solution was to put a regular sized seat onto the back of the bike for her, and put Toddler Chillikebab II in the BoBike. All very simple, you might think, and so did I. But whilst I love the Radish, things are not so straightforward when it comes to accessories. That large, wide rack on the back is too wide to fit a regular bike seat to. 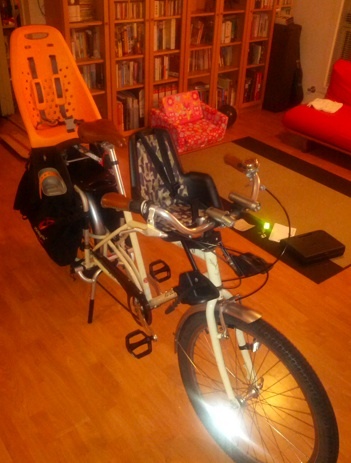 Indeed, the only seat that seems to fit is the ‘Yepp Maxi’ – this is the one Xtracycle sell to put on the back. There are two versions of this seat – one that clamps onto the downtube, and one that fits on the (special) carrier found on many Dutch bikes (as in real Dutch bikes Dutch people buy, rather than the general style). So my first thought was the one that clamps on the downtube, as it was going to avoid a whole bunch of additional accessories. But then when examining the Radish, I got worried that the design of the bike, with its sloping top-tube and long seatpost, was not going to be suitable to bolt the bracket to. And the other issue was the price. The Yepp Maxi is about $200 in Australia, and whilst it’s available in the UK for about $130, being so bulky the shipping cost was exorbitant (or else it could not be shipped). It all got worse when I started looking at the other bits I needed to bolt it to the back of the bike. I needed a new deck for the Radish, a bunch of mounting hardware and a rack adapter. Together with the seat, the whole thing was going to come to well over $400. 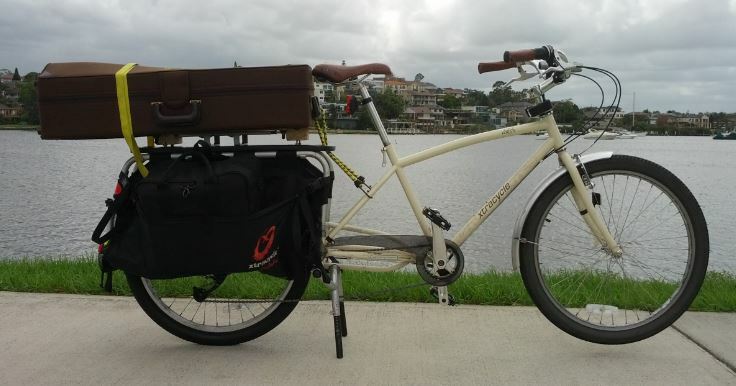 Given that you can buy a perfectly serviceable rear seat for about $70, and a perfectly serviceable new bike for about $350, I seriously considered simply buying a whole new bike for the purpose. So I ummed and ahhhed for some time. 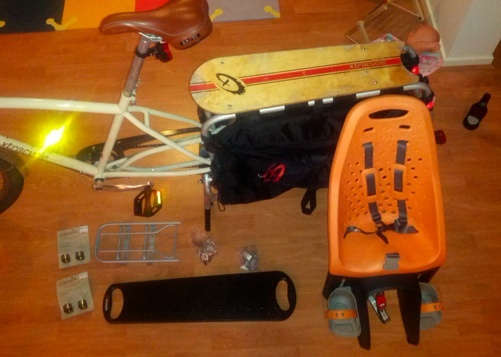 Eventually, however, I just bit the bullet and got on with it; the Radish is great bike for this kind of thing, and so I decided to fork out for all the relevant bits; buying the seat locally and ordering the other bits direct from Xtracycle. It all arrived promptly, so a week or so later I was able to get on with the task of bolting it all together. It was quite straightforward, and before long we were ready to roll. Toddler Chillikebab II absolutely loved it. 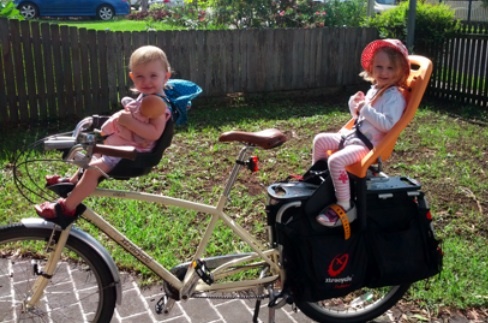 She laughed and giggled the whole time on our inaugural ride, and cried when we got home again and I took her out of the seat, pointing at it and saying ‘In! In!’. Little Girl Chillikebab also enjoyed her first ride in her ‘big girl seat’, and the fact she can climb up in and out of it by herself makes it doubly exciting (gotta love that twin-leg stand!). Since then, however, I sense that Little Girl Chillikebab is having second thoughts, having realised that being stuck on the back is less fun than up front with Daddy, where there are handlebars to grab and bells to ring. For me, well, it’s fun fun fun. The bike handing is dandy, and I can chat to them both quite happily as we go along. The fact that the rear seat is mounted further back than on a regular bike means I can look over my shoulder and see the passenger more easily. The Yepp Maxi is no doubt a very sturdy and well-designed seat (you’d hope so for that price! ), and you can easily remove it from the rack when you’re not transporting little people. The only thing about it that’s not great are the straps; the way the adjustment works means that you can’t make them especially small. Little Girl Chillikebab is quite slightly built, and even though she is three years old I can’t really get them as tight as I’d like. Given that the seat is advertised as suitable from two year old, I’m surprised – I’d be very sceptical that you could get a smaller child in there and strap them in securely. There remains only one problem, however. Transporting the kids is now a breeze, and we go on outings to the park and the shops. And I can remove the rear seat when I’m on my own. But the adapter thingy that the seat attaches to sits proud of the deck by about three or four centimetres – which means I have lost the long, flat surface I need to strap my trombone to. And crates of beer, for that matter. However, a solution to this problem soon presented itself, which I shall detail in a future blog post!